This early picture shows the block of Canal between the Clay statue (at the Royal/St. Charles intersection, just out of view at the left) and Carondelet/Bourbon Streets, crossing the center of the picture. We see trees on the neutral ground out from the latter cross street. The lack of traffic suggests an early morning time. All the tracks on the neutral ground belong to the New Orleans City RR. We can make out a track for the St. Charles Street RR in the roadway at the left, on the uptown side of the neutral ground, running from Carondelet to St. Charles. 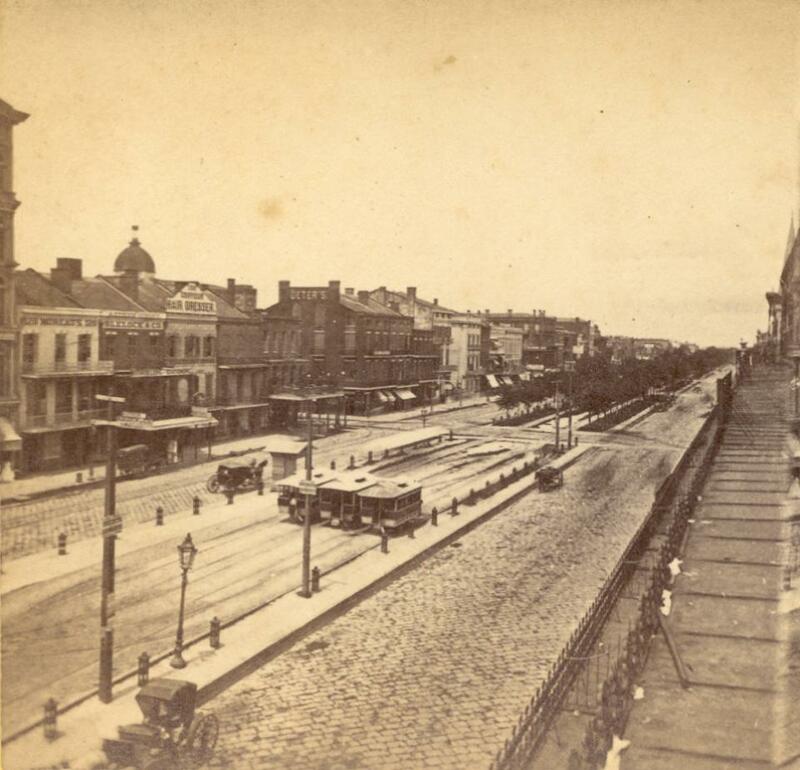 This and the next picture were the first evidence known to this author of streetcar tracks on Canal Street in the roadway rather than in the neutral ground. Another picture, discovered later (and not shown in this article), shows that this track extended out at least past Baronne Street, and probably to S. Rampart, for the Rampart & Dryades line (later called simply Dryades). (See also Picture 62.5.) Presumably, this roadway track was removed when the outer tracks of the Canal & Claiborne Streets RR were built in 1868. Those tracks had not been built when this picture was taken. We see outbound horsecars waiting on three layover tracks, with the empty inbound track at their left. The curves in the far left foreground connect to the turntable. The rightmost track can be seen to be connected to something else off the left edge of the picture; presumably, this would be the turntable for this company's Magazine and Prytania lines, on the other side of the Clay statue. On the near side of the Carondelet/Bourbon intersection, we can see the three layover tracks converging into a single outbound track.